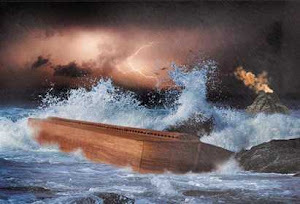 Waters of Noah: Wake Up and Stand Up! "And the LORD said to Samuel, Behold, I will do a thing in Israel, at which both the ears of every one that heareth it shall tingle. In that day I will perform against Eli all things which I have spoken concerning his house: when I begin, I will also make an end. For I have told him that I will judge his house for ever for the iniquity which he knoweth; because his sons made themselves vile, and he restrained them not." While it's clear that this Scriptural passage refers to Israel - the nation of Hebrews - there's an application for us, as a nation, as well. There's a spiritual danger for those who walk with Christ that I feel compelled to write about: apostasy. Eli was the high priest who knew God's word and served him. Yet he walked away from God and his sons followed in his footsteps. And it all began with one step. Make no mistake, friend. One step towards the world is one step away from God. Today's Seattle-Times article talks about how, "a proposal to legalize gay marriage in Washington state made it out of a final committee and faces its last major obstacle, a crucial vote Wednesday in the state Senate..."
When we see this abomination out in the open and there's no fear of God, then, as a nation, we are showing how lost we truly are. As Christians, we have to be aware of how apostasy works. The starting point is in our Bible reading and obedience to God's word. This is where we must be vigilant and guard what comes into our heart (Prov. 4:23). The 1st step that draws us away from God is subtle: We continue reading God's word but fail to obey it. Pretty soon, we stop believing what we're reading, so we put our Bible down. Finally, we simply walk away from our faith in Jesus Christ and believe whatever doctrine or whim blows down our path. As a nation, this is the state we find ourselves in. Godless. Hopeless. Helpless. And, lost. I realize people have opinions about homosexual marriage as well as about other topics. But, as Christians, the final authority is God's holy Word. Is it any wonder many want His Word out of the public life? It doesn't get any clearer than that. So, where do you stand?